Modern taxonomists seek to employ classification schemes that are consistent with the underlying evolutionary relationships among species. 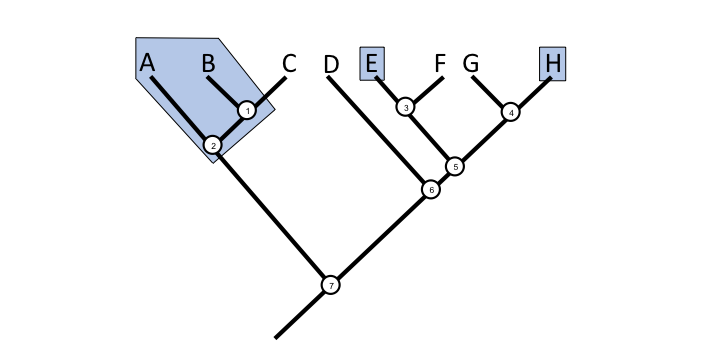 As shown below, phylogenetic analyses present a way to test existing Linnaean classifications (some of which predate widespread acceptance of the fact of evolution) and to determine which classifications are consistent with evolutionary history, and which require modification. An important goal of modern systematics is to apply scientific names only to groups of species that are monophyletic (from the Greek monos = one or single, and phylon = kind or tribe). A monophyletic group of species shares a single common ancestor and also includes all of the descendants of that common ancestor. 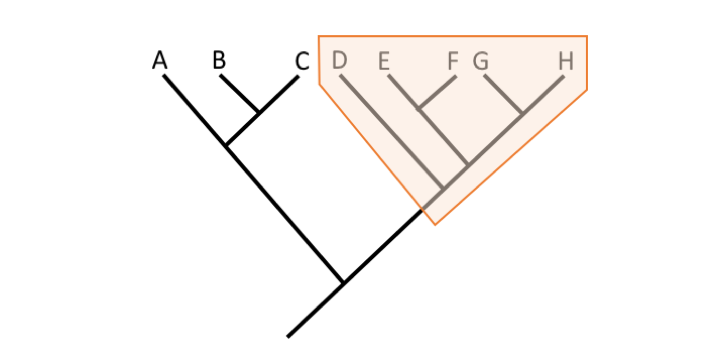 On a phylogenetic tree, a monophyletic group includes a node and all of the descendants of that node, represented by both nodes and terminal taxa. Thus, a monophyletic group is also a clade (see Section 4.2.1). A phylogenetic tree illustrating the concept of monophyletic groups, or clades. Note that monophyletic groups, or clades, are not mutually exclusive, but are nested within one another. Clades by Digital Encyclopedia of Ancient Life is licensed under a Creative Commons Attribution-ShareAlike 4.0 International License. 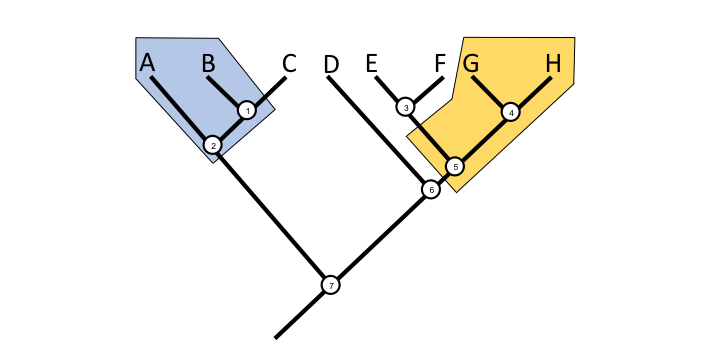 As discussed in Section 4.2.1, monophyletic groups (clades) form nested sets on a tree. Thus, any given taxon can belong to many monophyletic groups, some more inclusive, and some more exclusive, depending upon the ancestral node that defines each group. While each node on a phylogenetic tree can be used as the anchoring point for defining a monophyletic group, systematists do not necessarily seek to name every possible group. Rather, systematists generally try to define groups by critical features (synapomorphies) that unite them. For instance, Class Mammalia is a monophyletic group of animals that share the characteristics of having hair and mammary glands. The phylogenetic tree below shows the relationships of seven types of vertebrates, one of which is the extinct dinosaur Tyrannosaurus rex. Notice how each differently colored polygon represents a monophyletic group (clade): a common ancestor and all of its descendants. Each nested monophyletic group represents a different level of classification. For example, the crocodile, T. rex, and the bird are all assigned to the monophyletic Archosauria clade. One subclade of Archosauria is the Dinosauria; in turn, a subgroup of the Dinosauria is Aves, the birds. In other words, birds are descendants of a particular clade of dinosaurs–meaning that the Dinosauria clade is not extinct at all! Nested monophyletic clades of vertebrates showing how each clade corresponds to a taxon at a different taxonomic rank. Nested monophyletic clades by Digital Encyclopedia of Ancient Life is licensed under a Creative Commons Attribution-ShareAlike 4.0 International License. Each of the clades named on the cladogram above is defined by one or more synapomorphies. For example, Tetrapoda include vertebrates with four legs. All of the clades nested within the Tetrapoda include organisms with four legs. Four legs is thus the plesiomorphic condition within the clade Tetrapoda, but a synapomorphy relative to the more inclusive clade Vertebrata, which includes animals with backbones. 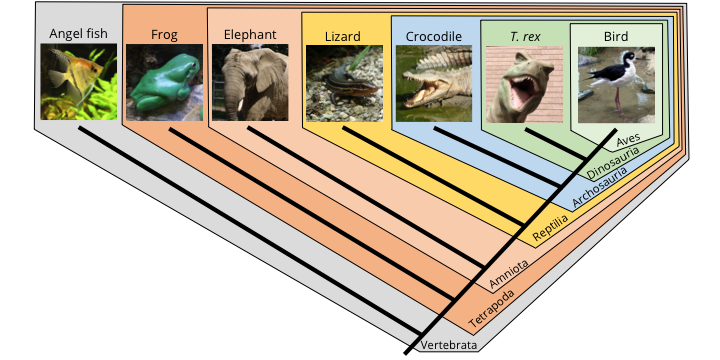 Note how the phylogeny corresponds with classification. The bird is a dinosaur, but it is also an archosaur, a reptile, an amniote, a tetrapod, and a vertebrate. Similarly, you are a mammal, but also an amniote, a tetrapod, and a vertebrate. Monophyletic groups can be contrasted with two other types of groups: paraphyletic groups and polyphyletic groups. A paraphyletic group includes a single ancestor and some of its descendants; it is similar to a monophyletic group, but some descendants are excluded. Examples of two paraphyletic groups, one represented by the blue polygon, the other by the yellow polygon. Paraphyletic groups by Digital Encyclopedia of Ancient Life is licensed under a Creative Commons Attribution-ShareAlike 4.0 International License. In the image directly above, the blue and yellow polygons each enclose a paraphyletic grouping. In the case of the blue polygon, Taxon A, Taxon B, Node 1, and Node 2 are included in the group, but Taxon C is excluded. 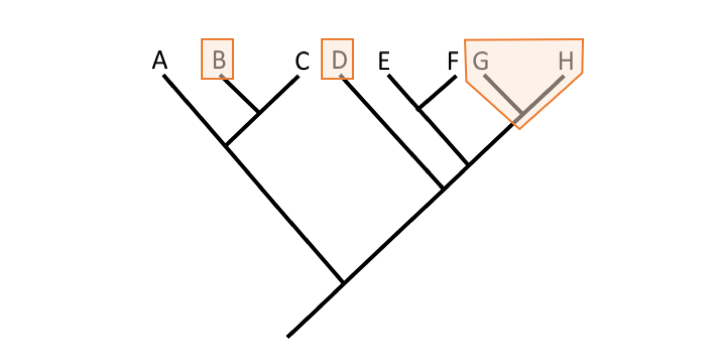 The group is paraphyletic because it does not include all of the descendants of the common ancestor represented by Node 2 (i.e., Taxon C is missing from the grouping). Can you explain why the yellow polygon also represents a paraphyletic group? In the traditional Linnaean classification system, reptiles represent a paraphyletic grouping. To understand why, have a look at the table of contents below from Zittel’s (1902) textbook on paleontology. Notice that Pisces (fish), Amphibia, Reptilia, and Aves are each assigned to the Linnaean rank of “class” (e.g., Class Reptilia). 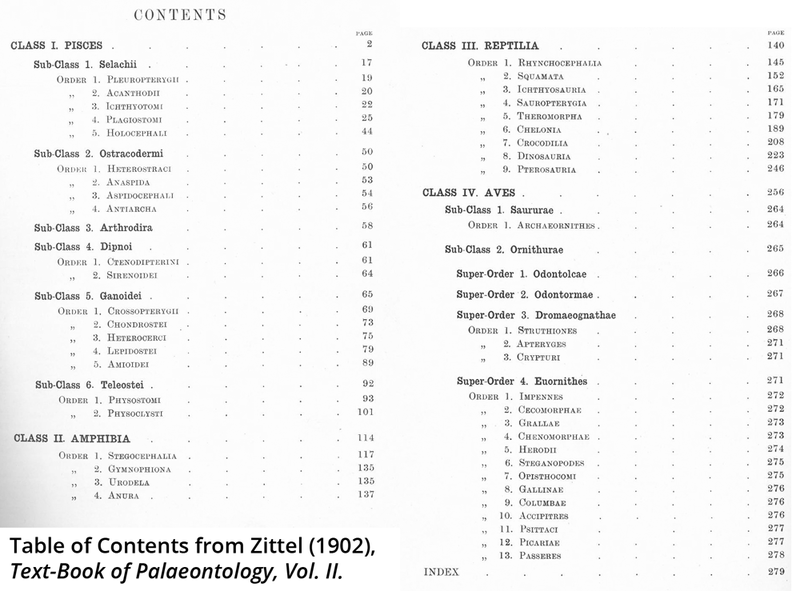 Table of contents from Zittel’s (1902) textbook on paleontology. 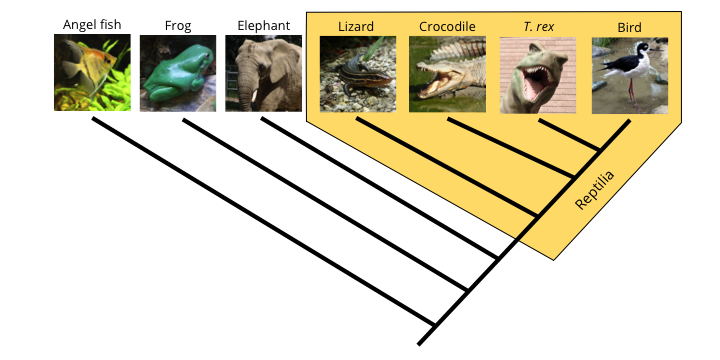 Now, have a look at the group identified on the phylogenetic tree as members of the Class Reptilia (yellow polygon). What is wrong? You can see that the reptiles in this context are paraphyletic because they do not include the birds (Class Aves). 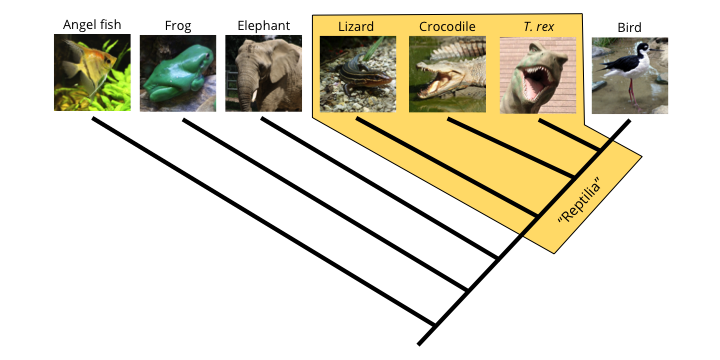 Phylogenetic tree demonstrating that exclusion of birds from the reptiles renders the Reptilia clade paraphyletic. Paraphyletic reptiles by Digital Encyclopedia of Ancient Life is licensed under a Creative Commons Attribution-ShareAlike 4.0 International License. If we instead accept that birds (Aves) are a subgrouping of reptiles, then we do not have any problems. 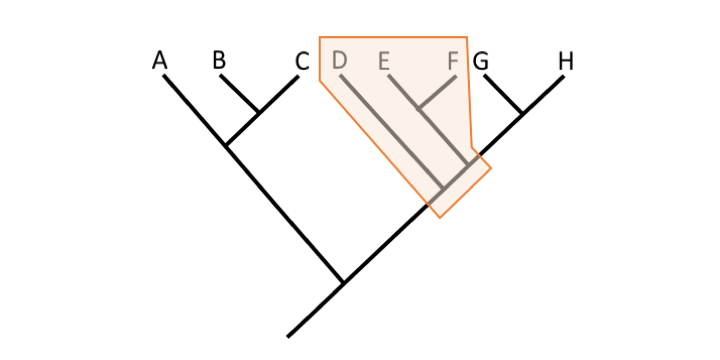 Phylogenetic tree demonstrating that Reptilia is a monophyletic clade if birds are included in the grouping. Monophyletic reptiles by Digital Encyclopedia of Ancient Life is licensed under a Creative Commons Attribution-ShareAlike 4.0 International License. Today, ornithologists (scientists who study birds) continue to recognize birds as belonging to Class Aves. As Aves is nested within the Reptilia, however, it is logically impossible to continue to recognize Reptilia as its own class: just as a state cannot contain another state (e.g., the state of California cannot contain the state of Nevada), a class cannot contain another class because they both are of the same rank. Instead, Reptilia could be ranked higher than class (e.g., superclass or subphylum) or be assigned a new name altogether. To avoid confusion, some biologists now recognize Reptilia by the name Sauropsida. A polyphyletic group (from the Greek polys = many, and phylon = kind or tribe) is a group that is not defined by a single common ancestor. 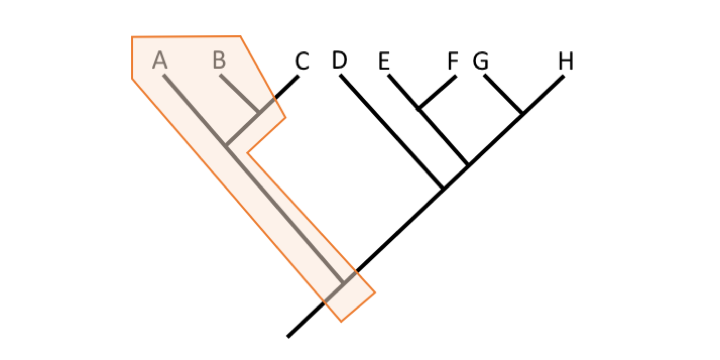 In this phylogenetic tree, Taxa A, B, E, and H collectively represent a polyphyletic group. Polyphyletic reptiles by Digital Encyclopedia of Ancient Life is licensed under a Creative Commons Attribution-ShareAlike 4.0 International License. 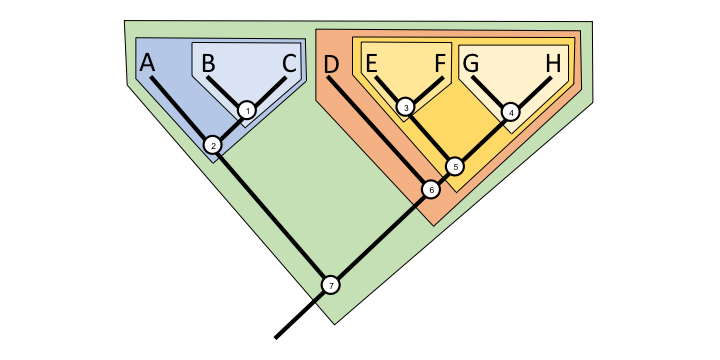 Imagine a genus with four assigned species, Taxon A, Taxon B, Taxon E, and Taxon H. Suppose a phylogenetic analysis of these four taxa, along with four additional taxa, revealed the hypothesis of relationships depicted above. Such a tree would render this genus polyphyletic because the common ancestor of the four species (Node 7) is not part of the group. Additionally, it is clear to see that the polyphyletic grouping is widely dispersed across the tree. Even if the common ancestor were included in the definition, Taxa C, D, F, and G would need to be included to make the group monophyletic. In the past, systematists may have named paraphyletic or polyphyletic groups due to overall similarity of features among a group of organisms and/or lack of understanding of their relationships. With the advent of new methods in systematics, particularly methods that use DNA sequences to determine the relationships among taxa, many previously paraphyletic or polyphyletic groups have been reorganized or dissolved so that scientific classifications follow the principle of monophyly. Outside of a historical context, is there any reason to continue to recognize or utilize groups that are paraphyletic or polyphyletic? While systematists may no longer wish to recognize such groups in formal classification schemes, paraphyletic or even polyphyletic groups may still be useful units of study in a structural (anatomical, morphological, and/or developmental), life history, and/or ecological context. For example, living land plant diversity is typically divided into four major groups in introductory biology or botany courses: bryophytes (nonvascular plants), ferns and fern allies (also called seedless vascular plants, free-sporing vascular plants, or pteridophytes), gymnosperms (naked-seeded plants), and angiosperms (flowering plants). 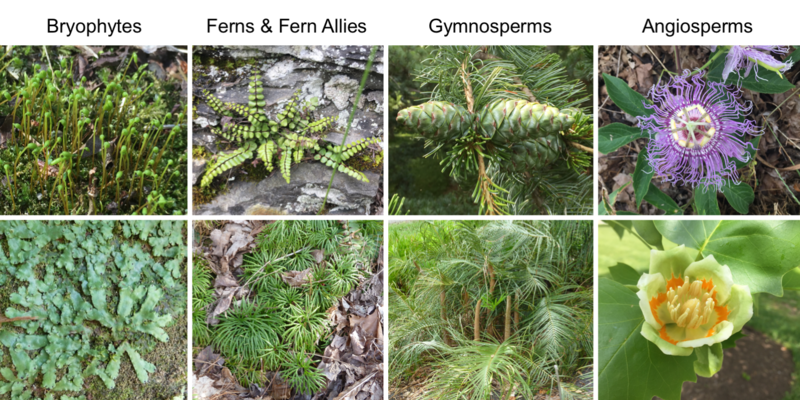 Two of these groups, the bryophytes and ferns and fern allies, are paraphyletic. (Living gymnosperms are also traditionally considered paraphyletic, although results from molecular systematic studies have more recently suggested that living gymnosperms form a monophyletic group.) Nevertheless, these four categories are convenient units to compare and contrast broad structural and life history features and trends in living land plants. The four major groups of land plants typically used to teach plant diversity at the introductory level. The images show examples of plants from each major group. Bryophytes: Moss (top) and liverworts (bottom). Ferns & fern allies: A fern (top) and lycophytes (bottom). Gymnosperms: A pine (top) and a cycad (bottom). Angiosperms: A passionflower (top) and a tulip poplar flower (bottom). Photo credits: All images by E.J. Hermsen. Major groups of land plants by E.J. Hermsen / Digital Encyclopedia of Ancient Life is licensed under a Creative Commons Attribution-NonCommercial-ShareAlike 4.0 International License. Polyphyletic groupings of taxa are also sometimes still recognized and utilized. For example, the algae are a polyphyletic collection of eukaryotic organisms that have chloroplasts and, typically, the ability to photosynthesize. (Sometimes, the prokaryotic cyanobacteria, or “blue-green algae,” are also included amongst the algae.) We now know that several unrelated groups of algae gained their chloroplasts when their distinct ancestors independently engulfed unicellular, photosynthetic organisms, in an evolutionary process involving endosymbiosis. The three types of algae illustrated below are from unrelated groups that gained their chloroplasts independently. Algae are studied in the field of phycology (from the Greek phykos = seaweed). Examples of algae from three unrelated groups, each of which inherited its chloroplast from a distinct ancestor. Left: A green alga. This alga inherited its chloroplast from an ancestor that engulfed a cyanobacterium. Center: A kelp. This alga inherited its chloroplast from an ancestor that engulfed a unicellular red alga. Right: A euglenoid. This alga inherited its chloroplast from an ancestor that engulfed a unicellular green alga. Photo credits: Left: Gabriele Kothe-Heinrich (Wikimedia Commons, CC BY-SA 3.0 License; Link). Center: J.R. Hendricks. Right: Deuterostome (Wikimedia Commons, CC BY-SA 3.0 License; Link). Unrelated algae by Digital Encyclopedia of Ancient Life is licensed under a Creative Commons Attribution-ShareAlike 4.0 International License. Most phylogenetic analyses conducted by biologists exclusively feature modern (extant) species as terminal taxa. Adding fossil taxa to these analyses can have variable effects. In some cases, the fossil taxa will nest among the extant taxa; in fact, some fossil taxa are more closely related to a living species than the living species is to its closest extant relative. (For example, all dinosaurs are more closely related to modern birds than birds are to their closest living relatives, the crocodiles!) In other cases, the fossil taxon will be located in a position basal to all of its living relatives. Systematists sometimes use the terms “crown group” and “stem group” to differentiate these types of relationships between extinct and extant taxa. Crown groups and stem groups are illustrated on the tree below. In phylogenetic terminology, a crown group is a clade defined by extant species. It consists of the most recent shared common ancestor of all extant members of a clade, as well as all of the descendants of that common ancestor, whether they are still living or are extinct. So, it is possible for fossil species to be members of a crown group. On the other hand, a stem group consists of a paraphyletic grouping of extinct species that are positioned basal to a given crown group (in other words, on its “stem”). A stem group is more closely related to its corresponding crown group than to the extant sister clade of the crown group. Because stem groups are always paraphyletic, they should not be referred to as “clades,” a term generally restricted to monophyletic groups. 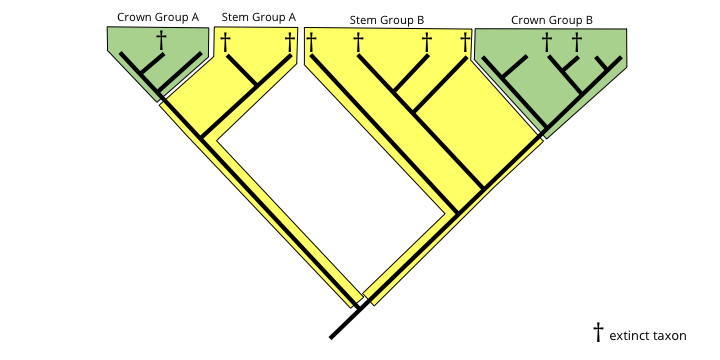 Example of a hypothetical phylogenetic tree with both crown group clades (green) and stem groups (yellow). Stem groups by Digital Encyclopedia of Ancient Life is licensed under a Creative Commons Attribution-ShareAlike 4.0 International License. 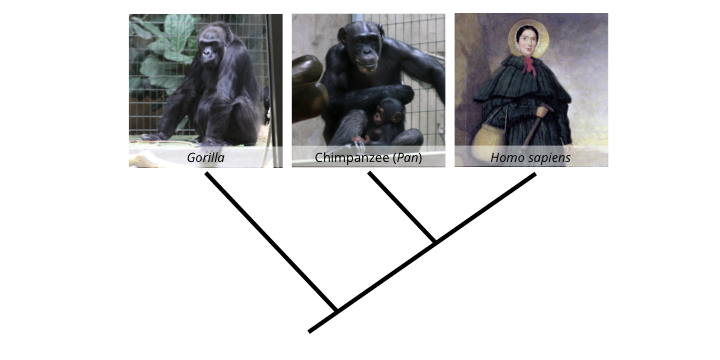 Let’s consider a real example of a stem group – one that is “close to home.” The phylogenetic tree below depicts the phylogenetic relationships of three species of great apes: a gorilla (Gorilla), a chimpanzee (Pan), and a Homo sapiens (in this case, the great 19th century paleontologist Mary Anning). All three of these great ape species are extant and belong to the crown group Hominidae, the great apes. Phylogenetic tree depicting the relationships between a gorilla, a chimpanzee, and a human (Mary Anning; image public domain [link]). Great ape phylogeny by Digital Encyclopedia of Ancient Life is licensed under a Creative Commons Attribution-ShareAlike 4.0 International License. Genetic data very strongly support the hypothesis that we are more closely related to chimpanzees than we are to any other living animal. Does this mean that we evolved from chimpanzees? Not at all! Rather than evolving directly from chimps, we instead share a common ancestral species with chimps that probably lived around 7 million years ago (it is represented by the node that connects the chimp and Mary Anning in the phylogenetic tree above). Our immediate evolutionary ancestor was a human species (i.e., another species of Homo) that is now extinct. If that extinct species of human were still alive today, we would recognize it as our closest living relative, not the chimpanzee. Such a case would be simple to make, as the extinct human species would look almost identical to our own species. As it turns out, we know about many ancient human (genus Homo) and human-like species that lived long ago, all of which share much more in common with modern Homo sapiens than they do with chimpanzees. These species–such as the famous Australopithecus afarensis (“Lucy”), Homo erectus, and Homo neanderthalensis–are referred to as hominins, a group to which we also belong. We are the sole living hominins; all other members of this group are extinct and may therefore be considered stem-group hominins because they are more closely related to us than they are to our closest living relative, the chimpanzee. Phylogenetic tree depicting the relationships between gorillas, chimpanzees, humans, and human-like relatives (stem-group hominins). 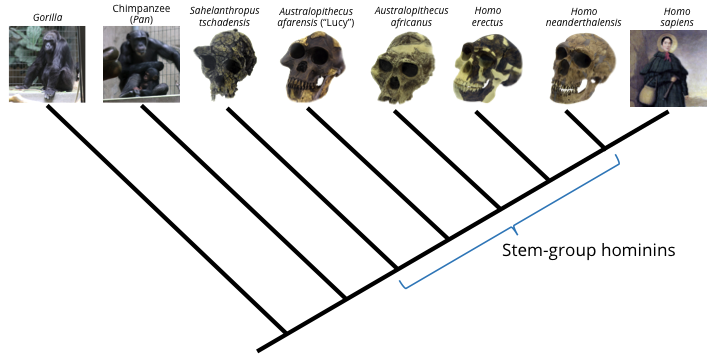 Stem-group hominins by Digital Encyclopedia of Ancient Life is licensed under a Creative Commons Attribution-NonCommercial-ShareAlike 4.0 International License. Is the identified grouping monophyletic, paraphyletic, or polyphyletic? Paraphyletic because it does not include Taxa G and H.
Polyphyletic because the selected taxa to not share recent common ancestors. Monophyletic because the grouping includes a common ancestor and all of the descendants of that common ancestor. Paraphyletic for two reasons: 1) because the grouping excludes Taxon C; 2) because the grouping excludes Taxa D-H (descendants of the common ancestor shared with Taxa A-C). What is the technical term for an extinct species (or collection of species) that is more closely related to an extant clade than the extant clade is to its most closely related sister clade?